Speed Queen washers aren’t widespread, so repairing them can be quite challenging even for service centers. The maintenance under official warranty takes pretty much time, and the guarantee period usually lasts for 12-24 months. Wonder if there’s a possibility to repair your washer quickly and for free? You can repair and maintain your home appliance using the troubleshooting guides present below. 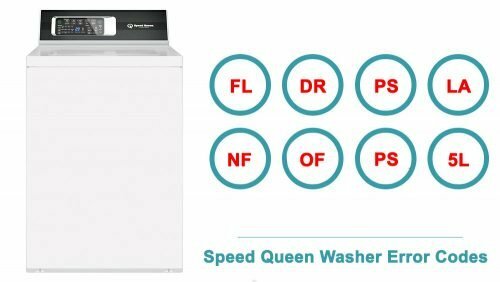 They are made in the form of tables for better understanding and cover different models of Speed Queen washing machines. Choose your model, and find the matching problem from the list. Instructions contain the most common technical issues, possible causes and ways to solve the problems. The tables also include the complete set of error codes for washers of different models and series. If your washer displays some certain error, you don’t have to guess what might have caused the problem – tables contain detailed information about every error. These instructions are provided by the official manufacturer and are made to simplify the maintenance process. Most of the described actions can be provided by an average user, but if you find it hard to deal with some issues, call a repair service center for professionals to eliminate mechanical damage and software bugs. Some serious problems should be trusted to the official service centers only. Er. FL on digital display • This code will appear if the washer has not reached the fill level after 30 minutes during a wash or rinse fill. • Make sure hot and cold water faucets are turned on. • Check the drain hose and drain receptacle to make sure they are installed properly and not blocked. Er. PS on digital display • The control has detected trouble sensing the water fill level. • Unplug the machine and call for service. Er. La on digital display • The control senses that the lid is open during a running cycle. Er. LLon digital display • The control senses that the lid has unlocked during a running cycle. • No or very little change in water level has been sensed within 5 minutes of the cur- rent fill. • The machine will begin to attempt to pump water out if the lid is closed and locked. • If the code does not clear, unplug the machine and call for service. Er . do on digital display • The control senses that the door is open during a running cycle. • U nplug the machine to clear this code. • Foreign object trap in pump may be clogged. Clean the trap. Er FL on digital display • This code will appear if the washer has not reached the fill level after 30 minutes during a wash or rinse fill. Er nF on digital display • The washer has not filled to the proper water level. • No or very little change in water level has been sensed within 5 minutes of the current fill. Er OF on digital display • This code indicates the washer has filled to the overflow level. • The machine will begin to attempt to pump water out if the door is closed and locked. • If the code does not clear, unplug the machine and call for ser ice. Er . dll on digital display • The control senses that the door will not unlock. Er ub on digital display • This code indicates that the wash load was unbalanced. • The unbalanced load may have limited the spin speed. • Be sure to use proper load sizes. Er 5L on digital display • This code will be displayed after a cycle for one minute, or until the Power/Cancel keypad is pressed, and indicates an over- sudsing condition.